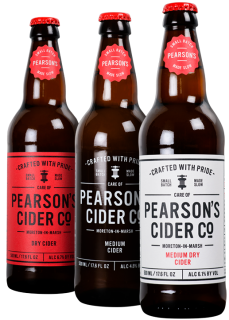 A Case of Perry Cider | Pearsons Cider. 12 Bottles of Medium Dry Perry. Pearson’s Medium Dry Perry is a lightly sparkling, straw coloured perry made with a blend of pear juice but predominantly featuring Jenkin’s Red pear juice. It is a very light and refreshing easy drinking perry that belies it’s 6% ABV. Great with cheese, meats and fish or just enjoyed on its own!